Kusatsu Onsen (草津温泉) is a naturally heated spring which discharges from the ground at a total of 32,000 L/m from more than 100 points across the area. It is one of Japan's top three onsen and is world famous for it's therapeutic properties. The water is high in sulphate, aluminium, sulfur and chloride which gives it a unique green glow. Heated by underground volcanic vents the water reaches 60 ℃. The water is good for the relief of neuralgia, muscle pain, dermatosis, bruising, sprains hypertension and fatigue. The strong sterilising power, which destroys germs and bacteria, is the secret to it's therapeutic properties. There are three free public Onsen. Hand Onsen and Foot Onsen are also available as well. 1. use JR Agatsuma Line to Naganohara Kusatsuguchi (1 hr. Kusatsu Onsen (草津温泉) is a naturally heated spring which discharges from the ground at a total of 32,000 L/m from more than 100 points across the area. It is one of Japan's top three onsen and is world famous for it's therapeutic properties. The water is high in sulphate, aluminium, sulfur and chloride which gives it a unique green glow. Heated by underground volcanic vents the water reaches 60 ℃. The water is good for the relief of neuralgia, muscle pain, dermatosis, bruising, sprains hypertension and fatigue. The strong sterilising power, which destroys germs and bacteria, is the secret to it's therapeutic properties. The acidity of the spring water is high enough that it can dissolve \1 coins (aluminium) in just under a week. It is said that Minamoto no Yoritomo visited here regularly. Tokugawa Yoshimune the 8th Shogun used to have barrels of Kusatsu water delivered to Edo castle all the way in Edo. 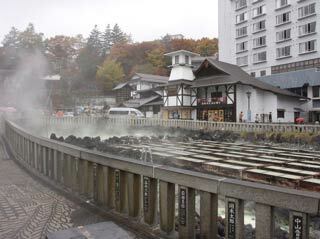 A survey by the Nihon Onsen Association states that 6 million people visit Kusatsu each year. Of the 330 onsen the Nihon Onsen Association listed in their survey, Kusatsu tops the list as the most popular in all of Japan. ... is located in the center of Kusatsuonsen and it is where Onsen water springs. There are Hand Onsen and Foot Onsen you can easily enjoy. ... is traditional way of cooling Onsen water down without adding extra water so that they can keep the healing quality of Onsen water. There is demonstration at Netsunoyu, which show you traditional Yumomi with traditional songs. If you are lucky, you can try this Yumomi.